This shop has been compensated by #CollectiveBias, Inc. and its advertiser. All opinions, princess puppy chow, and memories are mine alone. 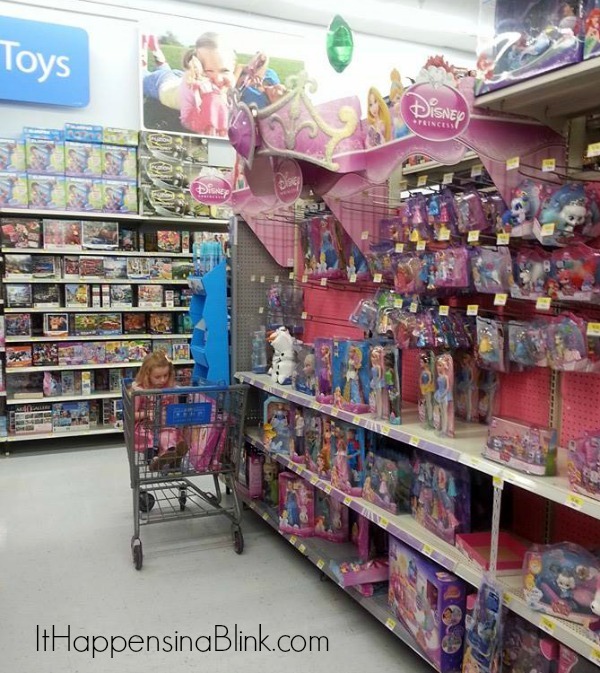 If you’ve been following me on Twitter and Instagram this weekend, then you know that my daughter and I had a fun day out on Saturday at the #DisneyBeauties Princess Event at a local Walmart. 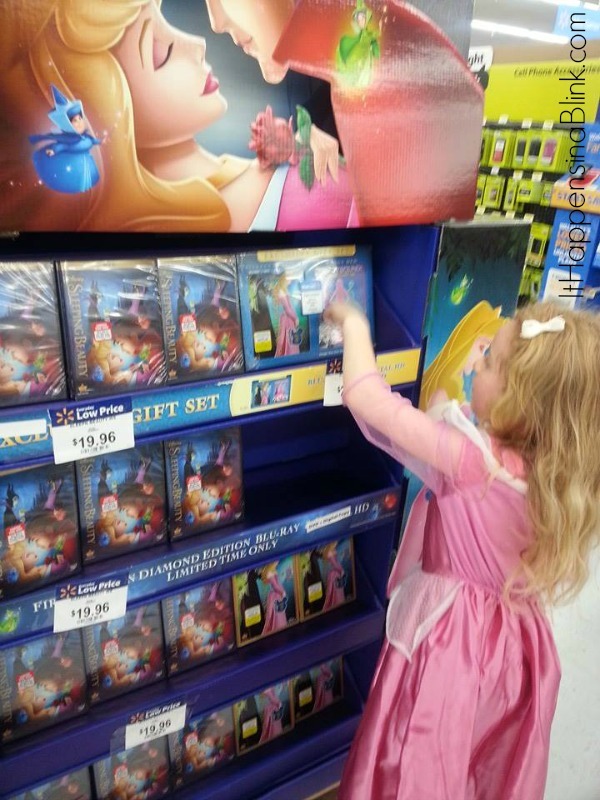 The event was held in celebration of the release of the Sleeping Beauty DVD, which my daughter was beyond excited to pick up. Today I want to share a recap of our fun day, as well as what we did afterwards. I couldn’t believe how much we were able to get accomplished without the little brothers tagging along. Not only did we get to shop, but we also were able to wrap a present, discuss a few princess lessons, and make Princess Puppy Chow for her friends. Whew! No wonder I was tired Saturday night! My daughter woke up ready to go. She wanted to be the “first one there.” We headed out not long after breakfast. 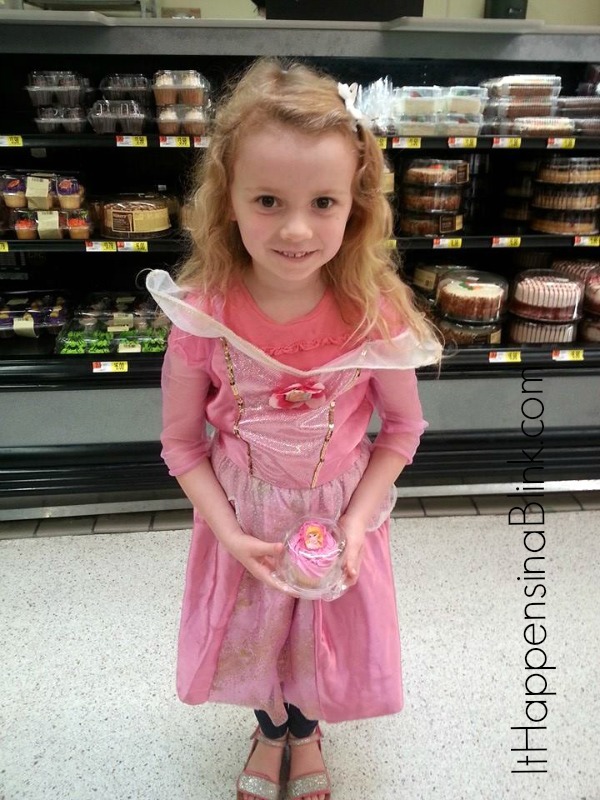 Once we arrived at our local Walmart, she made a beeline for the princess cupcakes. Yep, Walmart was giving out free princess cupcakes for the event! She was happy to sit in the buggy and chow down on her cupcake until we arrived at the display for the newly released Sleeping Beauty DVD. My daughter has been asking for the Sleeping Beauty DVD for months. She has noticed the commercials on TV for the release, so it’s been on her radar. 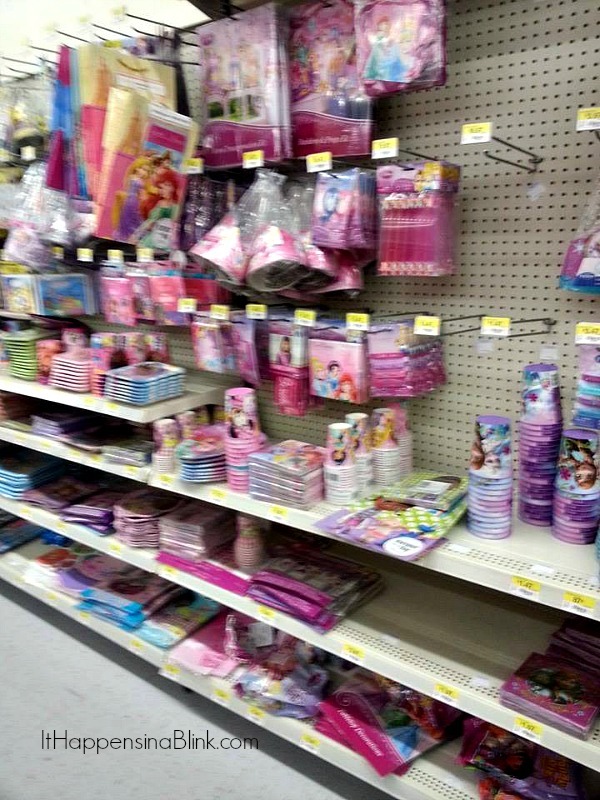 After picking up the DVD, we headed to the Disney Princess toy aisle. Here she is finishing her cupcake in the buggy before checking out the toys. I’ll share what she chose later in the post so sit tight! 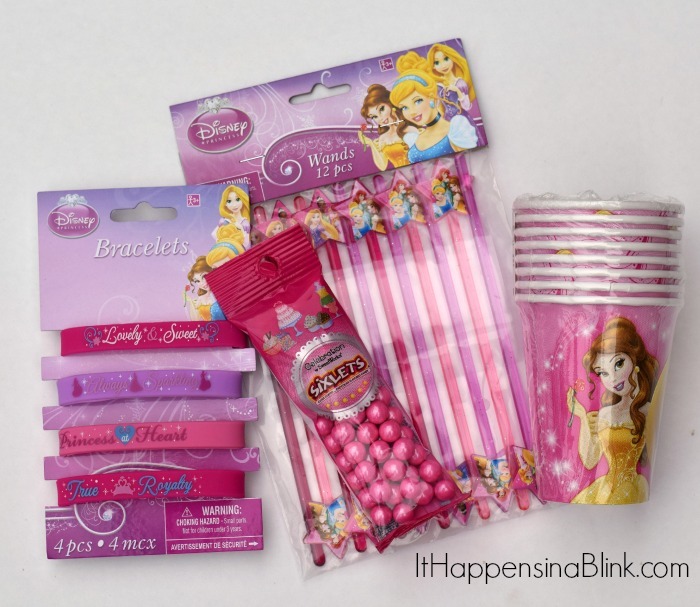 We then headed to the party supply aisle and picked up a few items for a secret princess project! On our way home, we had a serious princess discussion about the traits of her favorite princesses, and we concluded that they have two things in common: They share what they have with others, and they are always giving. Our goal once we arrived home was to do something that demonstrated both of these qualities. 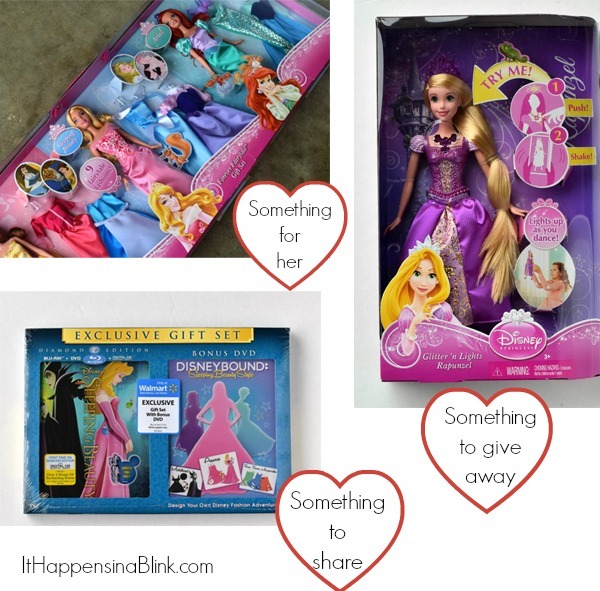 Princesses share what they have with others. As part of my daughter’s spending allowance, I gave her instructions that she should chose something to share, something for her, and something to give away. She chose the Sleeping Beauty DVD to share. Her thought process was that she would share it with her brothers and with her grandparents and friends at sleepovers and parties. I admit, that might have been a bit of a stretch, but I could tell that she had put so much thought into it that I let it count. 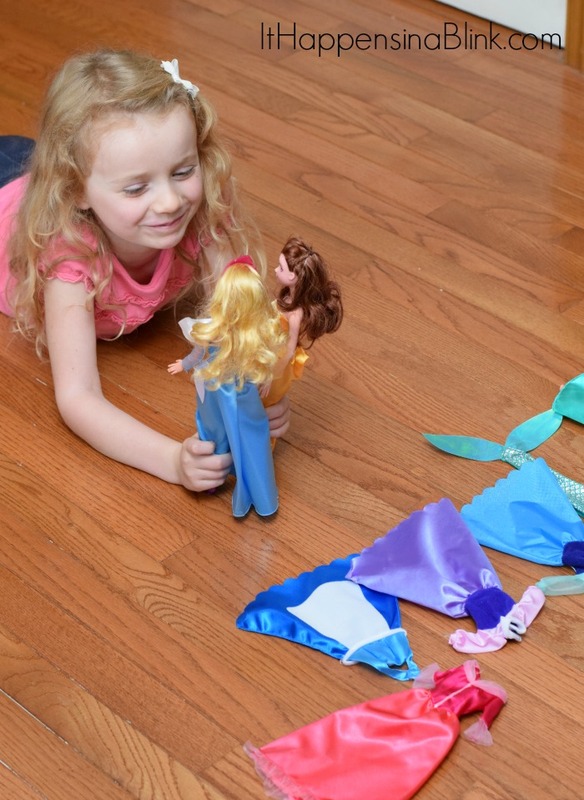 For her, she chose a three pack of Disney Princess dolls. 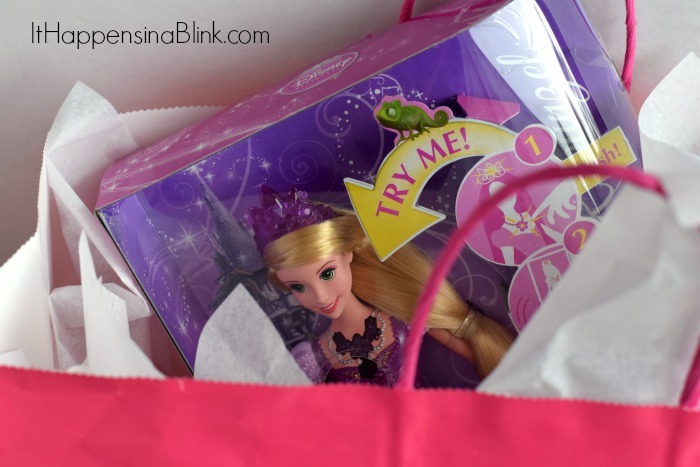 For her gift to give away, she picked out a Glitter ‘n Lights Rapunzel Doll for a family member’s birthday. She helped me wrap the Rapunzel doll in a bright pink gift bag for her cousin. I know that my daughter has had her eye on one of the Glitter ‘n Lights dolls for a month now, so I was very proud of her for choosing one as a gift for someone else without complaint. For a kid, sharing and giving go a long ways because it doesn’t always come naturally. My daughter doesn’t get many new toys outside of birthday and Christmas, but when she does, we have a rule that she has to chose something to give to someone else. Many times, this means cleaning out her toy bin and donating something. In essence, nothing new comes in unless something old is given out. I explained to my daughter that there are different ways to give. She can give of items, time, energy, and kindness. One of the most effective tactics my husband has found as a youth and children’s minister is to teach children how to be giving of time. Many times, children and teens see themselves as unable to give because they don’t have money, or a car, or other resources. He’s had success in showing them that oftentimes the best gifts are the small gestures that show someone that you are really thinking of them. For this Princess Lesson, we decided to make a batch of Princess Puppy Chow for all of her friends at church as a special treat. This way, she was giving of her time and items that we chose at the store. 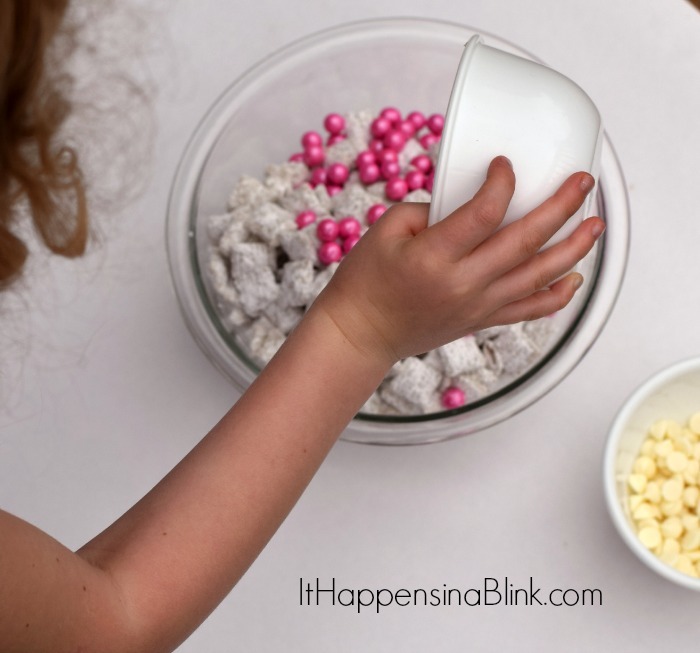 The puppy chow (or sometimes called muddy buddies) recipe is fairly basic, but it has a special ingredient to take it to the bling jewel factor! And today my daughter and I are sharing the recipe with you. 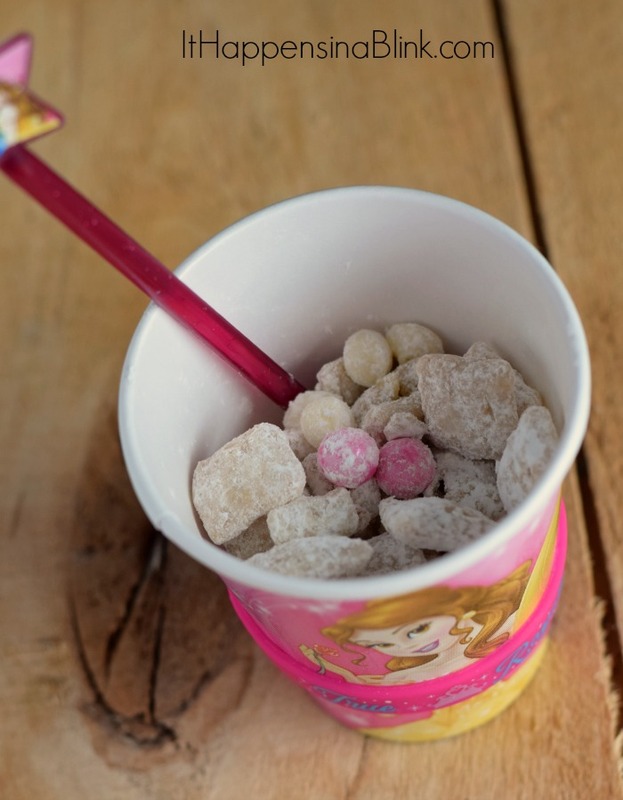 Want to make your own Princess Puppy Chow? To make the basic puppy chow recipe, I revised a recipe that I found over at my blogging buddy Seven Alive. Microwave white chocolate chips and butter in a bowl for 30 seconds on high. Remove from microwave and stir. If the mixture is not melted together yet, place back in the microwave at ten seconds intervals until melted together. Add vanilla to the mixture and stir completely. Add cereal, one cup at a time, until the cereal is covered with the butter mixture. Place the cereal in a sealable bag with the cup of powdered sugar. Shake until the cereal is completely covered. Pour the puppy chow in another bowl or in containers. From this point, making the Princess Puppy Chow is easy. Pour the Basic Puppy Chow mix in a large bowl. Grab the shiny pink covered chocolate and another 1/2 cup of white chocolate chips. 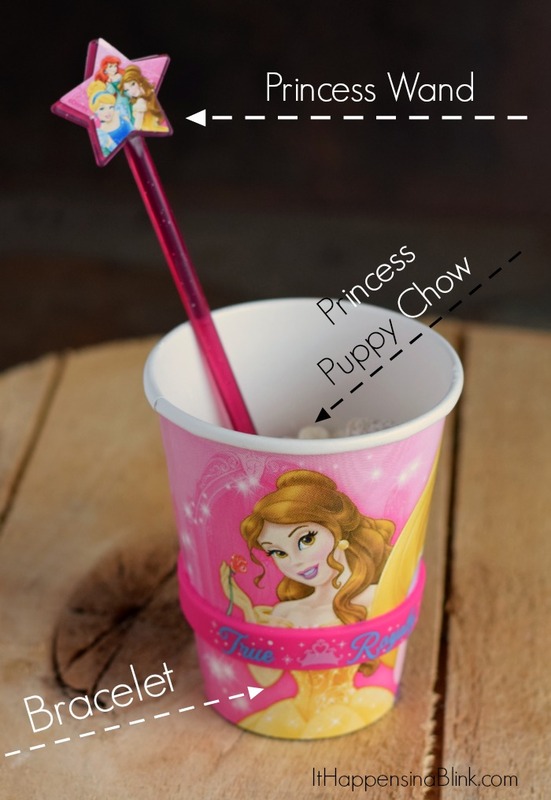 Portion the mixture into the Princess cups. After cleaning the Princess Wands, add one wand to each cup. 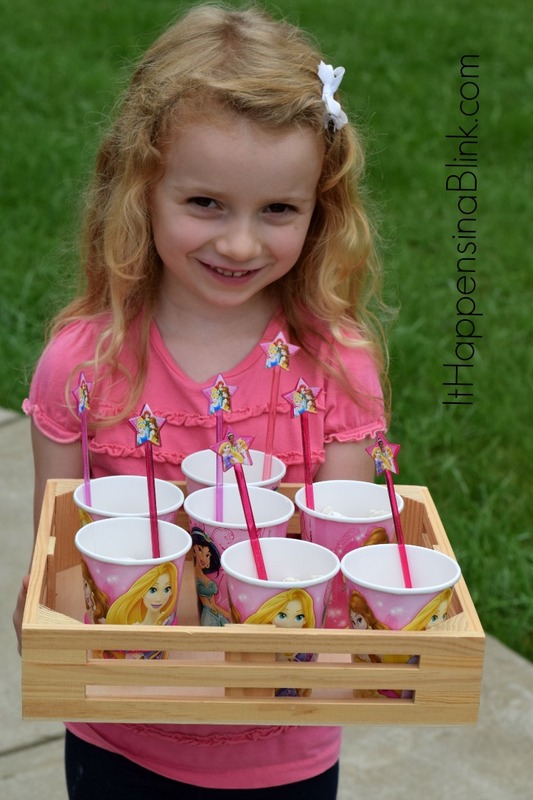 We also placed a Princess Bracelet around the cups as an added treat for her friends. 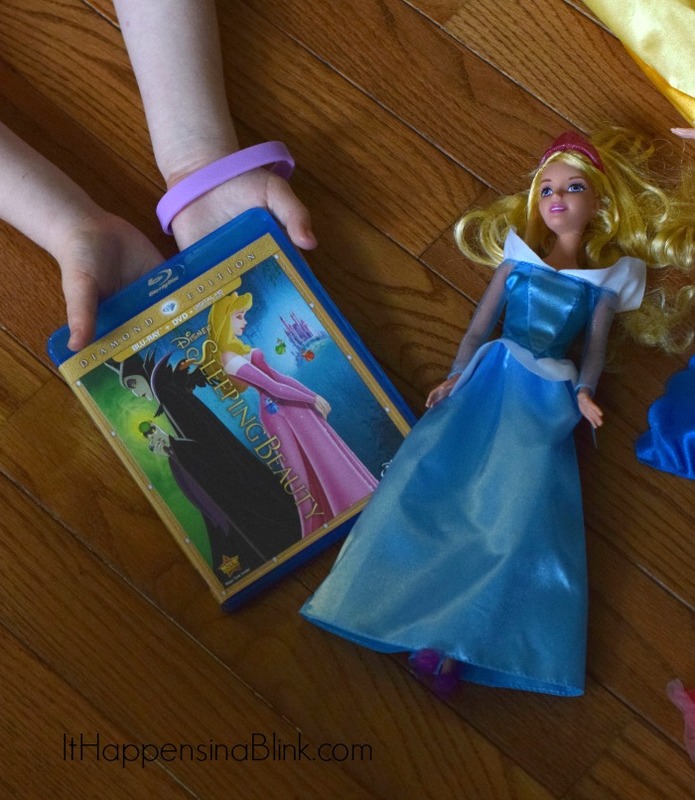 For us, Disney Princess movies are fun, but I want it to be more than that for my daughter. I want her to truly think about the lessons in the movies and implement them in her own activities. After getting her treats together for her friends, she was happy to get a chance to play with her new dolls. I’m sure her brothers also appreciated the Sleeping Beauty viewing later that evening. My daughter and I had a much needed Princess day together, and I’m glad that I was able to use our time for a few teachable moments. See a video summary of our day! Who’s your daughter’s favorite princess? WOW what a lot of fun!! Love it! This is so cute!! And I love that she gave away a gift! That’s a big deal for a little kid! I love that you used the opportunity to teach her about giving and kindness towards others, what a great idea! And what a fun event Wal Mart put on! Sleeping Beauty is one of my favorite movies and I love that Disney is bringing old movies out of the vault for the next generation! What a lovely party! You’re daughter looks like a real princess! 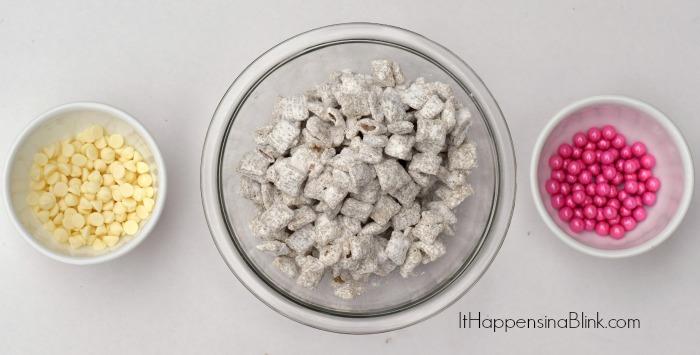 The puppy chow looks awesome and what a great lesson to teach! She’s adorable by the way! This is so fun! I bet she had such a memorable time. 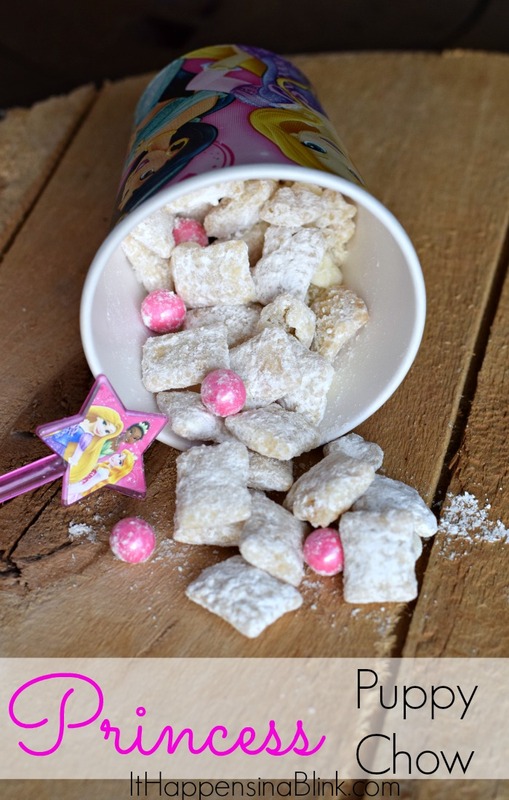 Love that princess Puppy Chow! My daughter would love it with the pink sixlets. 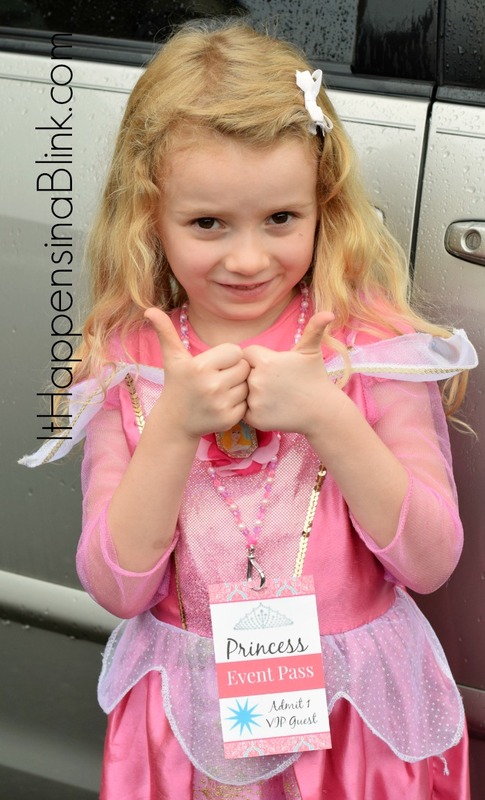 Her current favorite princess is Sofia. My daughter likes Sofia, too! This is ADORABLE! What an absolutely precious idea. I’m sure she just loved it. oh wow!! what a fun event! 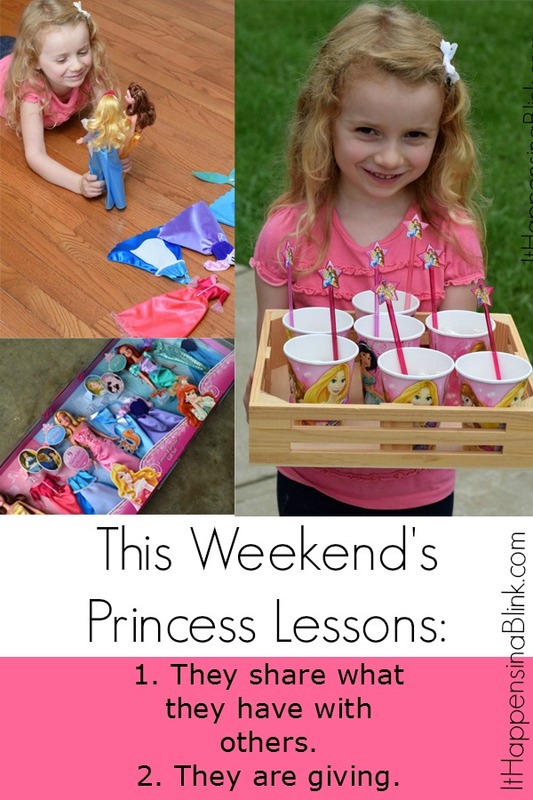 I love that you also made some lessons for princesses!! Oh my gosh how adorable!!! What a fun idea, looks like you guys had a blast! The puppy chow looks amazing as well. Sounds like it was a fun event for the two of you. And I love the lessons…those are wonderful lifelong lessons that would serve anyone well! What a cute party! And I love those event passes. A great idea! my favourite princesses are snow white, cinderella, aurora and belle but especially belle because i looks like her (in hobbies, acttitude , inteligence )but in man version 🙂 i love her so much! and when i was a young boy i felt in love with princess aurora and always i wanted to be like prince philip ! !